Astrophotography duo Bob and Janice Fera snapped this photo of the Cone and Foxfur nebulas, which are part of a larger system called NGC 2264 located in the Monoceros constellation about 2,600 light-years away from Earth. Two colorful nebulas shine side by side in a spectacular new skywatcher image. Astrophotography duo Bob and Janice Fera took this photo in January 2012 from Eagle Ridge Observatory in Foresthill, Calif. 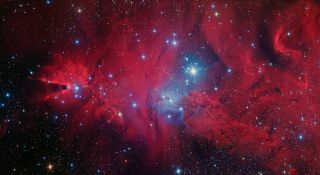 The two nebulas in the photo are called the Cone and Foxfur nebulas. They are part of a larger system called NGC 2264, which is located in the Monoceros constellation about 2,600 light-years away from Earth. A light-year is the distance light travels in one year, or about 6 trillion miles (10 trillion kilometers). The Cone Nebula's unusual shape comes from an intervening dark cloud near the swirl of hydrogen gas and dust. The Foxfur Nebula is so named because it resembles a woman's luxurious stole. Both of these cosmic structures are part of the larger NGC 2264 star-forming region.